One of the most worrisome requests I’m seeing from numerous people is for Valve to add low gravity in some form to rd_asteroid. I understand that it would be thematically appropriate, but I’ve played on lowgrav servers and it screws with class balance in all the wrong ways. Before requesting lowgrav, I highly encourage you to go try out a lowgrav trade server just so you get a feel of what lowgrav does to a playstyle. 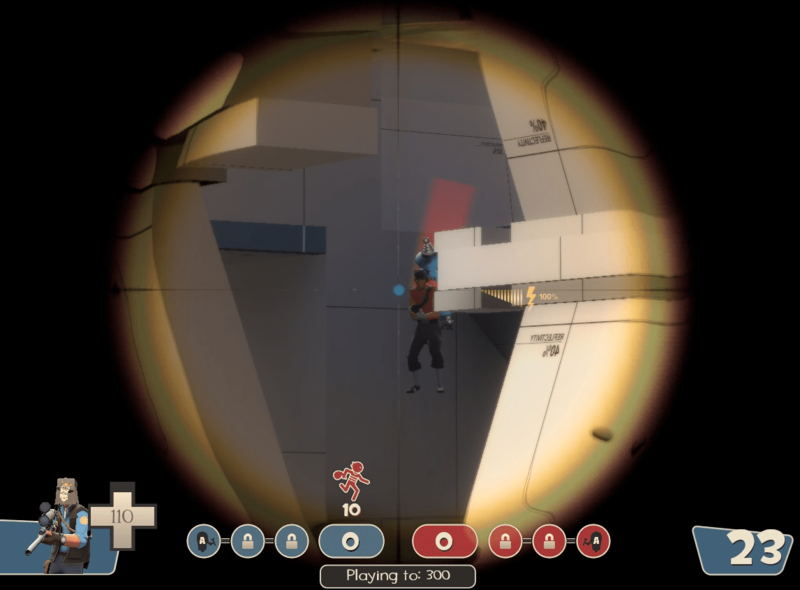 Scout in particular becomes downright infuriating to play. His dodging/strafing ability becomes crippled when every time his feet leave the ground he blimps slowly through the air in super-predictable arcs. Every class is forced to never jump or else they waft slowly back to the ground, leaving themselves extremely vulnerable. Sniper, conversely, has all the time in the world to line up his headshots on airbound targets. Soldier and Pyro take second place with their expanded ability to juggle/Reserve Shooter opponents into the air. It’s almost impossible for me to miss. Speaking of projectiles, they become significantly more difficult to aim if they aren’t the Rocket Launcher. Hitting someone at anything but immediate range with any arching projectile requires the player to ignore all the trajectories they’ve grown comfortable with because the arc will be significantly increased. Whenever I play Demoman my pipes and stickies fly over my intended targets, as do my baseballs and Mad Milks when playing scout. In contrast, hitscan is completely unaffected, and that’s ultimately the large problem with low gravity. Certain classes are crippled, others are buffed, and others just lose viable loadout options, leading to a game where the delicately-honed balance of Team Fortress 2 is fractured in all the bad ways. It’s Medieval mode all over again. But that isn’t to say there’s not some way we could add lowgrav into the space map, cause I see the thematic appropriateness. But it needs to be incorporated in a way that lets players avoid it if they wish to. Not “your whole base goes into lowgrav when the enemy steals your core,” or “the outside area is just lowgrav all the time.” If I had to pick somewhere, the best part of the current map to turn lowgrav would be the underground area with the pit, because you could play a whole round of rd_asteroid and never go down there unless you choose. Plus it doesn’t require jumping and it’s not a popular Sniper spot so the super-buffed classes won’t be able to cakewalk the entire area. The Winger and B.A.S.E. Jumper both contain elements of lowgrav, so it’s possible to make it work. The problem is that there are significantly more ways to make it work poorly.